Last summer, adult emerald ash borer (EAB) beetles were found in Lincoln, caught in a monitoring trap northwest of Pioneers Park. Nebraska Forest Service recommendations have always encouraged homeowners to not starting treating trees until their property is within 15 miles of an EAB confirmed site. However, last summer’s EAB find puts the majority of Lincoln and Lancaster county within the 15-mile treatment consideration zone. The current map of EAB detections and quarantined counties is online at http://nfs.unl.edu/nebraska-eab. What should homeowners do now? Begin scouting for signs of EAB activity in your trees and determine which of your ash trees are healthy enough to be worth saving. If you decide to treat, plan to make the first treatment this spring. EAB attacks healthy ash trees, laying eggs everywhere — in the upper twigs, secondary branches and main trunk. Healthy trees react to larval tunneling and kill many of the invading immature borers. As a result, in the early years of attack, borers typically survive only in small branches at the top of the tree’s canopy. This is the first symptom to look for — small branch dieback in the top one-third of a tree. As the infestation progresses, larger branches lower in the canopy die too. The next symptom is profuse suckering from the tree’s trunk or base. Healthy vigorous trees respond to branch death in the canopy by sending up suckers, or adventitious shoots, from the trunk to try and keep the tree alive. Trees do develop suckers for reasons other than EAB attack, but sucker development coupled with canopy dieback should send up red flags in a homeowners mind! As insect tunneling occurs under the bark, sections of bark die and crack in the following years. These cracks occur vertically, up and down the trunk, over a dead bark section. Woodpeckers are attracted to infested trees, pecking into the bark in search of tasty borer larvae. As a result of their search, they strip off sections of bark. This bark stripping in ash trees is another common symptom of EAB infestation. Finally, the last symptom to look for is small D-shaped holes about 1/8” across. These are adult beetle emergence holes. As the tree’s health declines due to increasing amounts of cambium damage, larvae are able to survive in lower sections of the tree trunk and the emergence holes are close enough to the ground to be easily found. If you suspect EAB in your trees, contact the Nebraska Department of Agriculture at 402-471-2351. Not all ash trees should be saved. We get very connected to the trees in our landscapes, so it’s difficult to evaluate with a critical eye and make the decision to let a tree die. Keep these thoughts in mind when evaluating your trees. Trees must be very healthy to move chemicals well, providing the desired protection. Trunk injections are damaging and trees must be healthy enough to recover. If a tree is already in bad health for reasons unrelated to EAB, it’s unlikely the tree will survive the treatments. Treatments are required for the life of the tree. Treatments are not like immunizations, they don’t protect the tree forever. Trees require treatment every one or two years, depending on the chemical used, to provide continued protection. New injection holes must be created at each treatment, causing additional wounding to the tree. Treatments can be expensive. If a tree is in a poor location, why spend money to treat it? Unfortunately, for many trees, the best long-term solution is letting the tree die and replanting. For help in deciding whether your tree is a good candidate, read Nebraska Forest Service’s “Selecting Trees for Emerald Ash Borer Treatments,” online at https://go.unl.edu/selectash. If you decide to treat, April through early June is the best time for treatment. Two main types of treatments — injection or soil drench — can be used depending on the size of the tree. In large trees, 45-inch circumference and over measured at 4 feet above the ground, injection of systemic insecticide provides the best control. But injections have drawbacks — specifically, they cause damage to the tree. Most are applied by drilling holes into the tree’s trunk, which opens up the trunk to insect pests and decay fungi. Drilling may also break through internal barriers, created by the tree within the trunk, to wall off internal decay. Breaking this barrier allows decay to spread into healthy wood. In addition, the pesticide itself can cause internal damage that may accumulate over years of repeated injections and potentially kill the tree, even if the pest is controlled. Small trees, under 45-inch circumference, can be treated with soil applications. Soil drench products are easy to apply, don’t require any special equipment or wounding of the tree and provide good control on young trees. 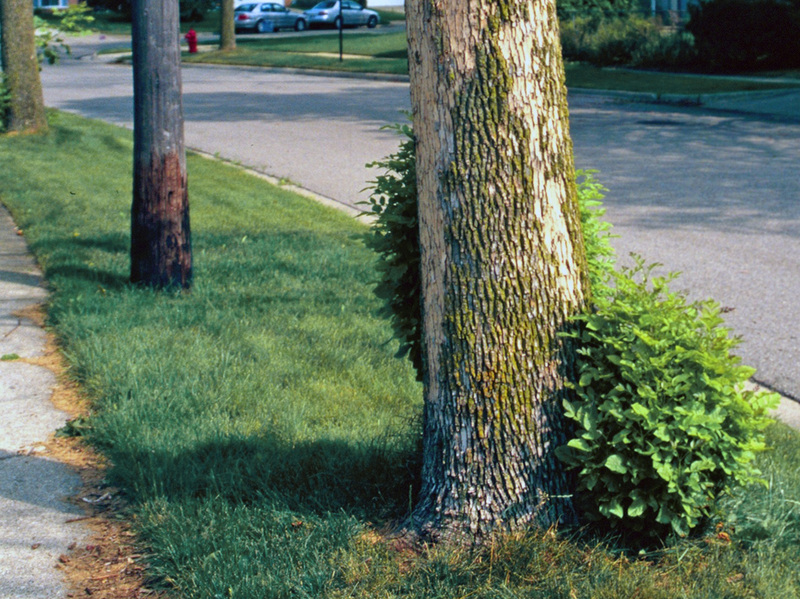 Note: EAB does not kill trees quickly; it takes a few years of continued infestation before trees begin to decline. Often insects have been in a tree for 2–3 years before signs of decline are noticed and 1–2 more years before the tree dies completely. If homeowners begin to treat their trees when 30 percent or less canopy dieback has occurred, an otherwise healthy vigorous tree can usually be expected to fully recover. Trees with over 50 percent canopy dieback, however, are less likely to recover. Adult beetles are small (only about ½-inch long), slender and metallic green in color. They emerge from infested trees in early summer, June and July, however the adult beetles are small and hard to find. Adult females lay eggs in the bark of branches or the main trunk. Larvae are borers and tunnel just under the bark after hatching. They are flat, cream-colored and legless. They have a brown head, and their bodies are divided into 10 segments, which are bell-shaped near the back end of the insect. At maturity, they reach 1½-inch in length.